Hatch Technologies has been a leader in the web hosting and e-commerce industry in the United Arab Emirates since 2001. We wholly own all of our servers and network equipment, we are profitable, debt free, and all growth is funded from revenue. Our long-term experience and stability are reflected in our prestigious customer base. Our servers are located in data centers that are secure, stable, and well connected. Each center offers a minimum of three Tier-1 Internet providers running the border gateway protocol version 4 (BGP4). In addition, each center has diverse, fiber-optic building-entry points, uninterruptible power supplies, power feeds from a minimum of two utility companies, and onsite backup generators. 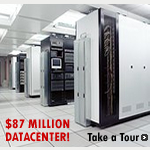 Our servers are located in an $87 million state-of-the-art facility. It's the same data center that houses such giants as Google.com, Microsoft, About.com, IBM, Yahoo, and General Electric. When choosing a business host, what better neighbors than these? Hatch Technologies offers our clients one of the largest, most technologically advanced network-operations centers in the world. Our network provides high-speed access through non-congested private peering points throughout the Internet. This results in faster, more reliable performance than overcrowded public access points used by typical virtual hosting providers.